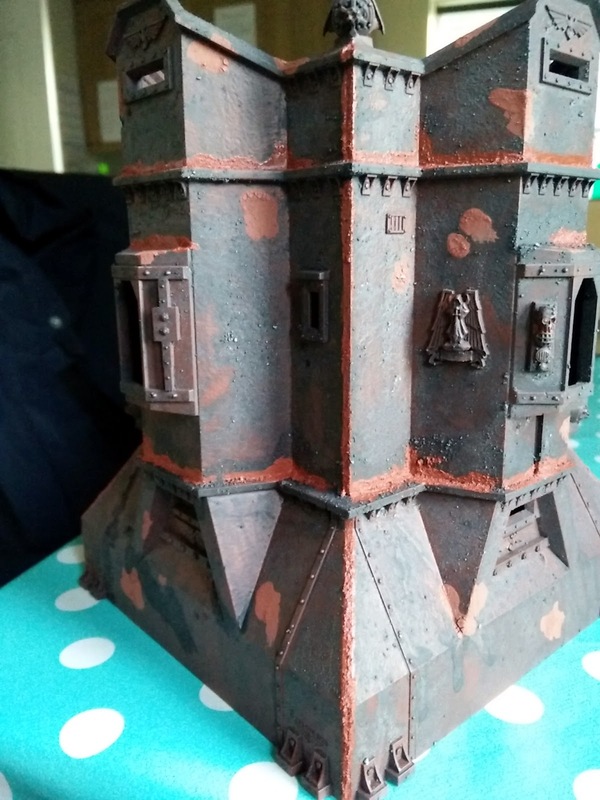 Having rinsed the salt stained bastion to within an inch of it's lifeI had to try and recover some of the actual richness in the colours that also leakeed away. Bastion 1 got another load of shadow washes in all the nooks and crannies. Angel green is next, considering I never rated it as paint I'm really getting through it all now. 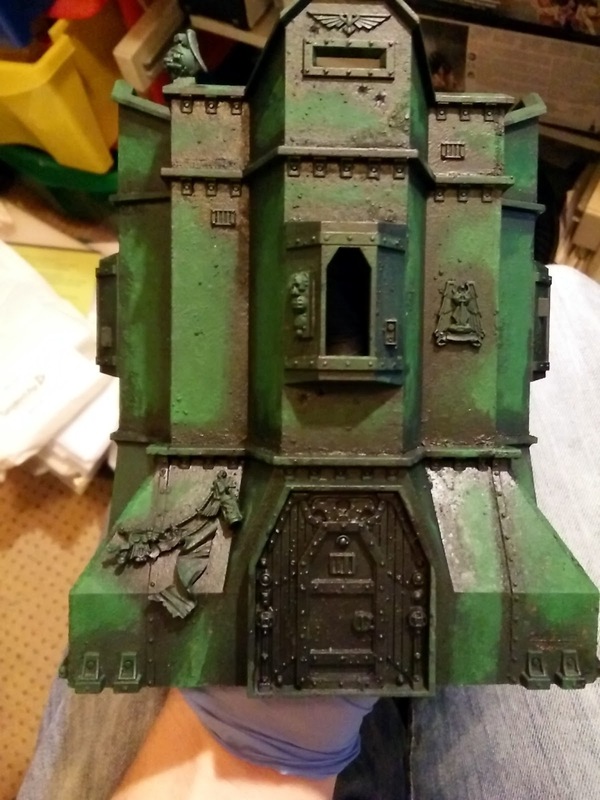 It goes on but just tints the underlying colour, it definitely works on the Hunter Green to create a much more vibrant colour but it can be very difficult to obscure the areas of shadow I may have been more exuberant with than I should have. Bastion 2, and as you can see this bears little resemblance to the grungy orange beast you last saw. The shadow/texture/grime wash has dried very flat on the red oxide primer. 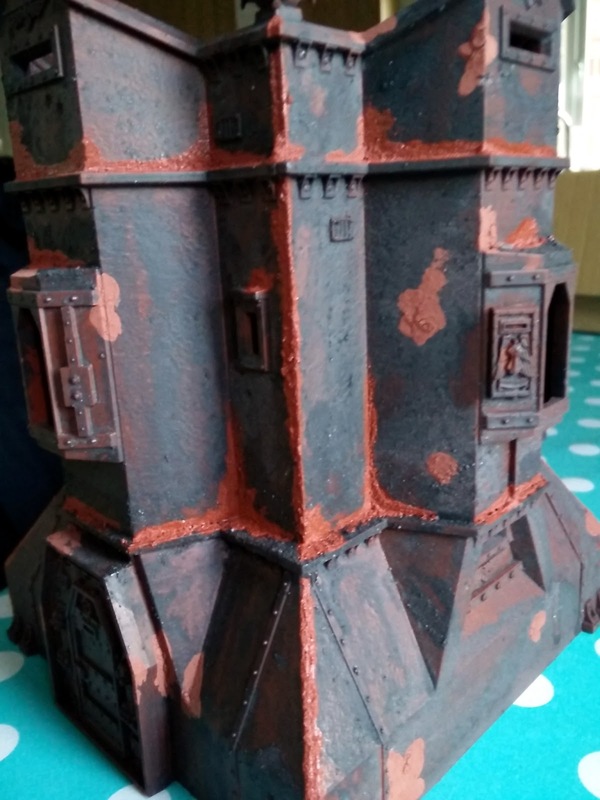 I've then worked a load of red oxide texture paste into all the crevices and on edges to try and cover up cracks and seams. It's questionable the amount of effort going into this when I'll be covering it all up with green. I suppose if I'd been doing the salt weathering technique or using one of those chipping paints then it might be justified. But I'll stick to what I'm comfortabel with, deviations from the norm have met with little success so far. However, the Martian Ironearth is still something that is paying dividends so I've used it in places here. Looks great, I like the beat up look you have going on both of these. They'll be a little tidier but hopefully the planned rust and weathering might grunge them back up a bit. Cheers, slowly, slowly, catchy, Jokaero!